Volunteer at the Iowa City Parks and Recreation STEAM Fest! Do you have a passion for getting kids excited about Science, Technology, Engineering, Art and Math? 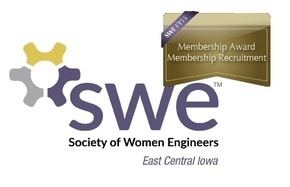 Then you should join SWE-ECI at the Iowa City Parks and Recreation STEAM Festival. This annual event allows kids to explore various activities. The festival is set up like a street fair where community organizations and businesses set up booths with activities, and the kids are allowed to roam freely! This year, SWE-ECI will be teaching kids about robotics, programming and electronics! We will be using Ozobots to teach kids the basics of programming. The kids will also be able to explore electronics through the creation of LED circuits (using alligator clips, resistors, and LEDs). Basic Arduino circuits will also be available to show kids what the "inside" of a robot might look like! If interested, please RSVP using the form below. Contact Katelyn Lichte (eci-k12.outreach@swe.org) for more information!